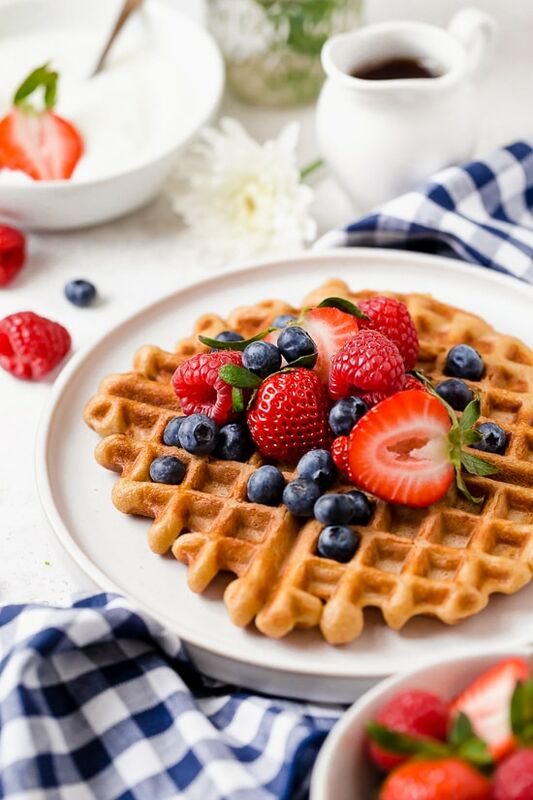 Whip up these protein-packed Yogurt Waffles for breakfast and freeze the rest for easy meal prep! 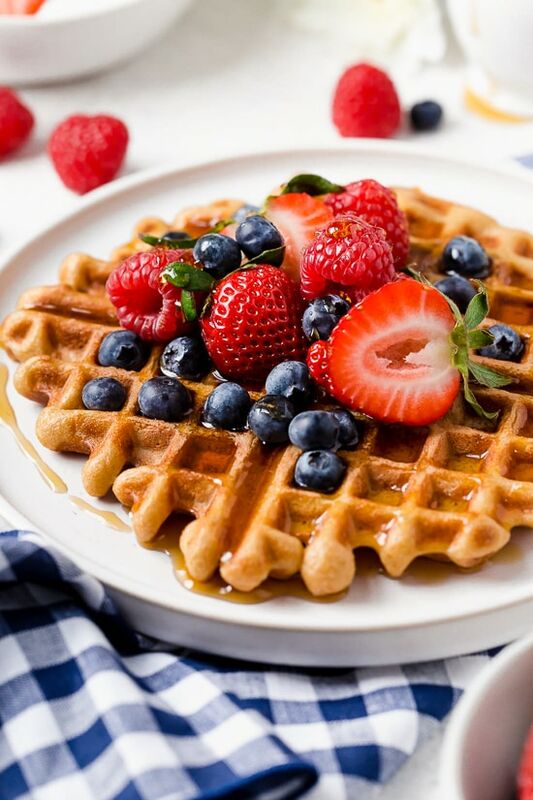 These delicious blender waffles made with yogurt in the batter are so easy to make and come out perfect with wheat or gluten-free flour. Make a double-batch for meal prep freezer meals for homemade waffles in minutes. I’ve been testing lightened up waffle recipes for years cutting back on all the butter or oil typically needed for perfectly cooked fluffy waffles and have never been happy enough with the results to share a recipe here – until now! 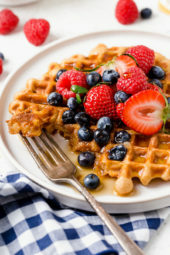 Turns out, yogurt in the batter really does the trick and bonus, it adds protein to the waffles! 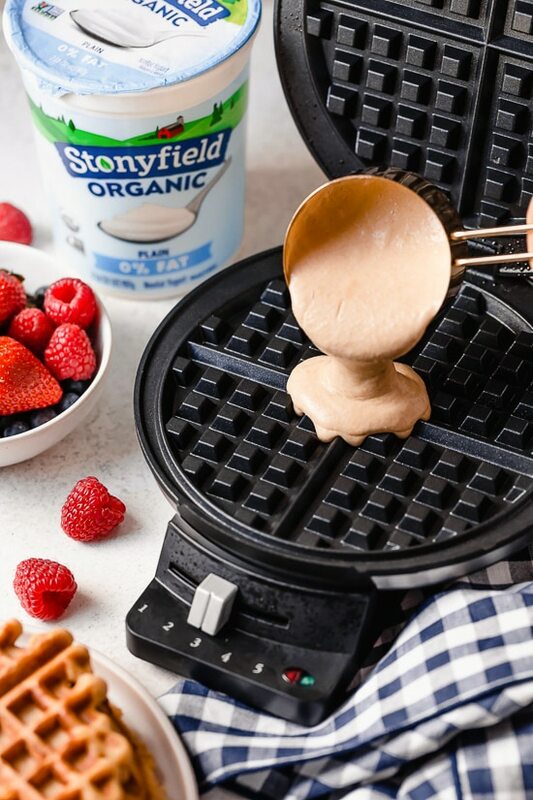 I partnered with Stonyfield, my favorite yogurt brand to create these healthy waffles with their Stonyfield Plain 0% Fat Yogurt. I tested them with both wheat and gluten-free flour and they both came out great! Combining but almond milk with yogurt keeps the calories down, and I skip the sugar altogether, leaving that for the topping. I use a classic round waffle maker, not a Belgian which you can see here, it’s about $25 and I have had it for years. If your is square, it should still be fine, you will have to adjust the amount of batter you use depending on the size. Place the sugar into the mixing bowl and add the chilled whipping cream. 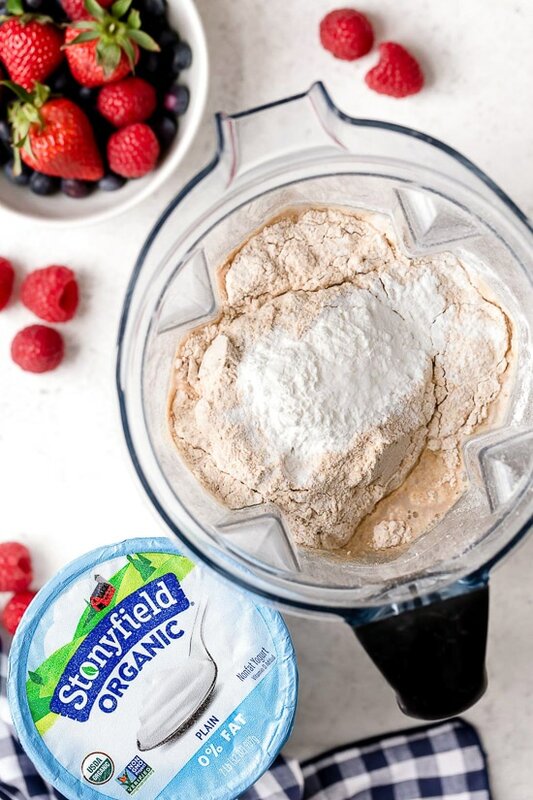 Using a hand mixer, whisk at medium speed until the cream and vanilla reaches stiff peaks, about 2 to 3 minutes; whisk in the yogurt for 15 seconds or until incorporated. Makes 6 servings about 2 1/2 tablespoons each. Leftover batter can be stored in an airtight container in the fridge for about a week. 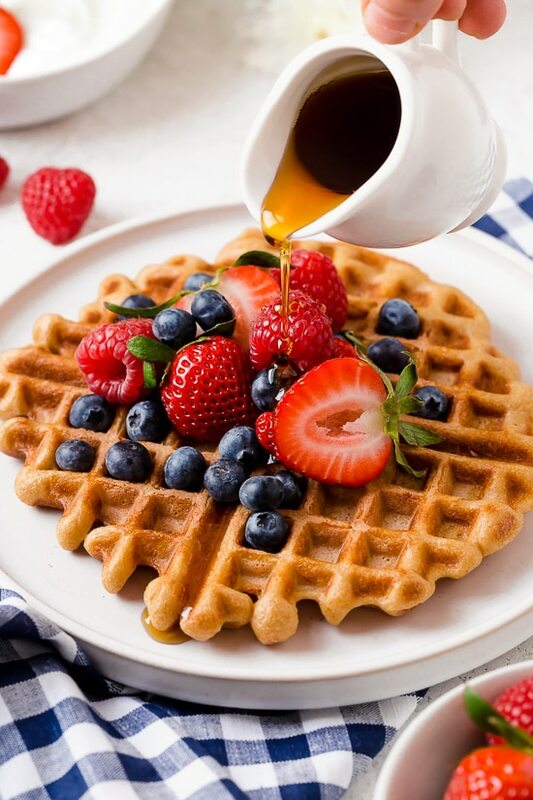 Cooked waffles can be frozen and reheated in the toaster. To freeze wrap in plastic wrap and label the date with a sharpie. In a blender combine, starting with the liquid first add the milk, yogurt, eggs, vanilla, flour, baking powder and salt and mix until well combined and smooth, about 30 to 60 seconds.Heat a waffle iron over medium heat (I used number 3 on mine) and let it heat up.When hot spray with cooking spray and pour 1/2 cup of batter in the center, close and cook until golden brown and slightly crisp on the edges, about 3 to 4 minutes.Repeat with the remaining batter or refrigerate the remaining. *To make gluten-free I tested this with Cup4Cup Gluten free flour and added 2 more tablespoons of almond milk. Disclosure: This post is sponsored by Stonyfield. Thank you for supporting the brands that make Skinnytaste possible. All thoughts are my own. Photo credit: Jess Larson.